It's hard to believe the end of the year is near! 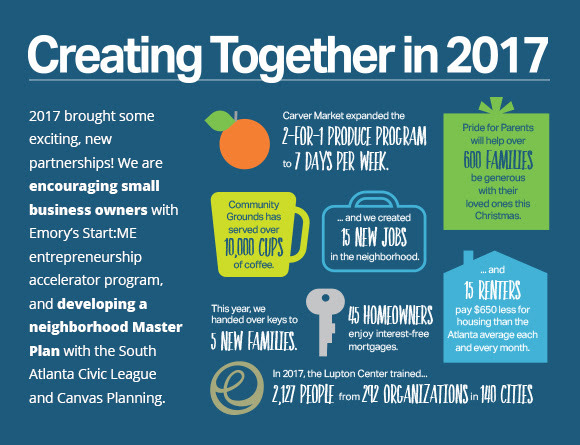 We've had a busy 2017, welcoming new homebuyers into the neighborhood, leading trainings and workshops, selling bananas, oranges, and other produce to local shoppers, and joining up with new partners to expand the good work happening in South Atlanta. It's a joy and an honor to serve in our community, and we are so grateful for your partnership as we create together. Here's a quick look at 2017! We couldn't do this work without the generous support of friends and organizations throughout the country who give to FCS. Will you join us as we look toward 2018? Thank you!